Until recently there's was only one realistic way of travelling to France with my dog, Falco, and that was by Eurotunnel. 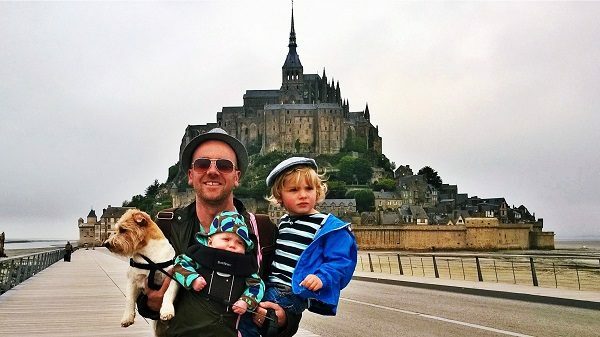 I've tried kennelled him on a ferry before (an overnight one) and he'd lost his voice from barking so much by the morning, says dog lover and travel writer, Paul Wojnicki. Things changed with the introduction of a new service between Portsmouth and Le Havre that allows dogs to stay in the cabin with their owners. Brittany Ferries have very commendably run a similar service to Bilbao for years that is now legendary among dog owners, so I decided to try the service as an excuse for travelling to one or two of my favourite destinations in Normandy and to visit a very special graveyard that I hadn’t even heard about until a couple of months ago, but which peaked my interests not just from a historical perspective, but also as a dog owner. Our journey starts with a late night crossing from Portsmouth, a little too late for the children but understandable as the ferry only arrives from Le Havre at around ten o' clock. It's close to midnight by the time we are in our cabin and the children are ready for bed. Falco and I are tired too so we take a quick walk on the designated deck to see if there’s anyone he can socialise with (there isn’t) and then we curl up in bed ourselves. We arrive at Le Havre the following morning at 8am and head straight to Ouistream, to let Falco and the kids romp on a beach most famous for the D-Day landings in 1944. The beach is long, wide, dog-friendly and virtually deserted so Falco has a great time storming it from the surf as the kids build their sandcastles. It's sobering to think however that 71 years ago, almost to the day, men were running onto the very same beach in fear of their lives from the German defenders. It almost makes playing here feel like a guilty experience, perhaps that's why it's so empty. Out of respect to the areas dramatic history I leave Falco and the kids with their mum for an hour to visit Ranville War Cemetery, which is only a ten minute drive away. There are more than a dozen war cemeteries in the area with thousands of graves but I've chosen this one in particular because it has a rather unusual grave in Plot IA, Row G.
Grave 13 is unusual as far as war cemeteries go, because it contains the remains of a dog named Glen and his owner- Private Emile Servais ‘Jack’ Corteil. Glen and Emile served together in the 9th Parachute Battalion, 6th Airborne Division at a time when they were experimenting with parachuting dogs. Yes you read that right, parachuting dogs. Hard to believe now but then it's hard to believe many things that happened in this quiet corner of France just over 7 decades ago. Glen was a German Shepherd who parachuted into Normandy with Private Corteil on D-Day. Both were tragically killed along with several others by "friendly fire" on the 6th June 1944 after landing in the wrong area and being mistaken for German soldiers by an RAF Typhoon pilot as they made their way to their actual objective. It's a terribly sad story but I'm comforted by the fact that they are at least buried together. I'm not ashamed to admit that I feel a tear roll down my cheek as I take one last look at the grave before returning to a more jovial atmosphere on the beach. The D-Day landings aren't the only battle that Normandy is famous for; the Battle of Hastings may have taken place on our side of the channel but the most famous account of it is hanging just half an hour from the beach we've just been playing on. The Bayeux Tapestry is close to a thousand years old and although dogs aren't allowed into the Musée de la Tapisserie de Bayeux we decide to take it in turns to visit the 70 metre long masterpiece. I suppose the tapestry is most famous for its depiction of Harold with an arrow in his eye but I'm here to look at one of the lesser known aspects of the tapestry- the 35 dogs that are embroidered into it. Apparently England was famous for its hunting dogs in the 11th century and in one scene Harold is seen boarding his ship with the dogs all around him before being blown off course. I gaze at the fabric for a long time; the freshness of the colours is deceiving and it's hard to believe that this historical account of man and dog's bond is over 900 years old. To the right of the scene depicting Harold's dogs is one in which Harold and William save drowning men from the quick sand at nearby Mont St Michel, so it seems fitting that we’re moving on to France's second most visited monument next. It's easy to understand why the Mont is second only to the Eiffel Tower in popularity once you set eyes on it for the first time, even from a distance it is a truly spectacular sight, floating like a mirage on the sea (or mudflats depending on the tide). The abbey is the highpoint, literally and metaphorically, but it began as a humble little monastery sitting on a rocky outcrop. Over the years medieval buildings sprung up around what would eventually become the most recognisable abbey in the country, if not the world. By evening and the crowds have all but cleared and it genuinely does feel like we’ve stepped back in time as we cross the same mudflats that Harold and William were depicted rescuing the sinking soldiers from. It’s here, at the base of the island, where the fishermen and farmers traditionally toiled. These peasants maybe consigned to the past but the merchants who have plied their wares for centuries along the cobbled streets are very much a part of the present, we pass shops and restaurants aplenty as we wind our way upwards to the abbey. Souvenirs and postcards are probably the most common goods nowadays rather than fish and textiles but the ambiance doesn’t feel overly touristy at this time in the evening. And then we’re at the abbey itself, peering down at the streets and the mudflats 80 metres below, it’s one of the most spectacular buildings in Christendom, surrounded by some of the best preserved medieval streets in Europe but Falco just wants to urinate on the walls- typical really! We decide against going inside the abbey, Falco wouldn’t be allowed inside, and the kids would no doubt run amok and spoil the tour for others, but fortunately we’ve been here before and, despite the fact that it’s one of the most beautiful buildings I’ve ever seen, we don’t feel cheated about not going inside today. Indeed less than ten percent of the island’s visitors take a tour of the abbey, most come for the beauty of the Mont itself. Brittany Ferries run a number of dog friendly services from Portsmouth to Normandy and nearby Brittany. Overnight services are available to St Malo (which is less than an hour from Mont St Michel) and Caen (which is literally on the doorstep of the D-Day beaches and Ranville War Cemetery). We chose to use the Portsmouth Le Havre service as dogs are allowed in the cabins on this, rather than staying in a kennel. Le Havre is just over an hour from the D-Day beaches and Ranville war Cemetery, 1 hr 30 from the Bayeux Tapestry and 2 hrs 20 from Mont St Michel. Home Away is a holiday rental site that actively targets dog owners (the dog from their YouTube advert actually reminds me of Falco in his winter coat). At the time of writing they listed 14 pet friendly rentals in the immediate area of Mont St Michel, including villas with pools that can house up to 18 people. There are dozens more in the surrounding areas but it’s best to be close to the Mont so that you can enjoy it late at night or in the early morning. Home Away also list 291 dog friendly properties in the Caen/Bayeux area, which is the best place to base yourself for the D-Day beaches. WATCH: 5 Dogs Who Love to Dance vs 5 Dogs Who Just Don’t – Who Gets Your Vote?